Some users willingly give up Megabytes of RAM to skin and beautify their system. One area that is often overlooked is the volume controller. The software 3RVX (via Shell Extension City) tries to change this by offering a skinnable volume controller that adds some very nice effects to the system. It comes with seven great looking skins that use alpha blending and fade effects. A total of six hotkeys can be set in the application which comes with three pre-configured ones to lower and raise the volume plus to mute the sound totally. Each time a hotkey is used the volume control skin will be shown, the changes are made visible and the volume control fades slowly away if there is no further user input. The program options provide access to some interesting features. 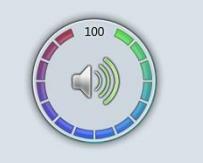 A custom change amount for the volume sliders can be chosen by entering a percentage value in the program. That could be interesting if you want to fine tune the volume of the music. The Fade Delay and Speed can be changed in the options but more interesting than that is probably to select a custom sound mixer. 3RVX looks definitely nice and could be an option for users who like stylish little applications. The Microsoft .net Framework 3.5 is required to run this application. nice … is there any way of disabling default notification in Vista?